Model Shivani Persad is a citizen of the world and brings an enthusiastically open mind to all of her endeavors. 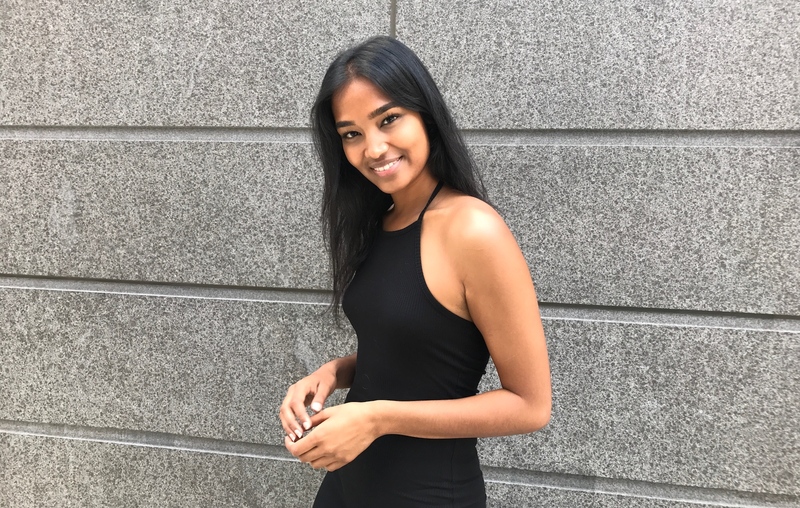 The Trinidadian beauty with Indian roots grew up in Canada and now calls New York City home. You can see her in campaigns for Naturalizer and Aerie, and she’s also a radio host and an advisor to the Model Alliance. She uses her multicultural and multitalented background to educate others about shadeism (colorism), social inequality and feminism. We met with the brainy beauty to find out how she developed her podcast and what she wishes people would stop asking models. You run a podcast called More than a Model — what made you decide to create this show? What did you feel like you were not being asked as a model? Shivani Persad: Anything! I got so sick of being in castings and people only asking “what’s your favorite style?” or “who’s your favorite designer?” Just because I am a model doesn’t mean that I am super into fashion and beauty. I know lots of models that are really smart, but how come no one else knows that? I was listening to the Girlboss podcast by Sophia Amoruso every day and loved it. It just made me realize that I wanted to be a girlboss too. I decided that instead of interviewing women entrepreneurs I could just interview models. So many models are entrepreneurs, have blogs or are activists. Nobody knows about that and I decided that I was going to tell people. You’re Trinidadian Canadian. How have both cultures shaped you as a person? Trinidad is such an amazing island and has a great culture. People don’t realize that Trinidad is made up of Africans, Indians, Chinese, Latinos, Caucasians, Syrians and more. It’s such a rich culture. That has a lot to do with me being into multiculturalism, being aware of shadeism, institutional colonialism, white supremacy and things like that. I also love the chill lifestyle of Trinidad, however it’s also a very corrupt place and they do need some help like other islands do. I think that affects why I am so into politics. As much as I love my culture, it’s just not perfect. Same thing with Canada, I love being Canadian and a lot of the things people say about Canadians are true — we do say sorry a lot and we are really nice [laughs]. At the same time, I meet super nice people in New York. However, there are certain things I will always cherish as a Canadian; I will never fathom paying for healthcare because I spent 18 years of my living in a great country where I didn’t have to pay for it. I think being Canadian has influenced me to be as socialist as I am. Not everything is perfect there though either! I am aware of the atrocities committed towards indigenous people — we’ve done a lot of bad things that other countries have done too. I am very much aware that neither country is perfect. What’s something that people don’t know about Trinidad? I like to always tell people that carnival was born as a way for oppressed people and minorities to speak up and show up against how people treated them. It’s not just us being in bikinis and shaking our asses. Minorities came together and decided they wanted to share their culture. Some people say that the feathers were used to make fun of the rich people who enslaved or employed then. There’s an ability to celebrate even though you are oppressed every day. Do you have any Trinidadian beauty secrets? I don’t know if this is Trinidadian but I love toner — when you have brown skin you tend to get shiny. It really rehydrates your skin and you can use it under makeup, on top of makeup or in the morning. It really refreshes your skin. I also know people there love coconut oil so much. I do too, I don’t even want to use moisturizer anymore. You are really politics and the current political situation is very tense. What do you think about Donald Trump’s statements about white supremacy? We’re too educated to allow these things to happen. He’s obviously a very privileged person and has been his whole life. Everything he says you have to take with a grain of salt because his perspective is so skewed. It’s evident that he doesn’t represent 99 percent of the population. He lives in his own world. It’s funny how he calls people fake news because he’s the fake news — you have no facts about anything! As to his statements about Nazis, that there are both sides, those people really shouldn’t exist. One side oppresses people and one side doesn’t. We should be progressing as a society to get past that type of thinking. What social activism are you involved with? What issues interest you most? Intersectional feminism is a really big one for me. It’s really easy to be like “girl power” but for many women of color there are issues that affect them on top of gender. Shadeism and colorism are also very important to me because I experienced that first-hand. Environmental activism is very important to me because in fashion, we are the number two contributor to climate change. I also care about issues like animal testing, consumption of water to create things like denim, and more recently mental health is really important to me. The more I research the more I find out that mental health contributes to homelessness. That’s something that the government should be trying to alleviate. It’s not just their socioeconomic surroundings that affect them, but also the issues within themselves. You mentioned colorism, what are your thoughts on the subject? Growing up I was made to believe that light skin is the right skin. I never thought that I was pretty because people outside of my immediate family would comment that I was dark just like my dad’s side of the family, and that I had such dark skin with the connotation that it’s not attractive. Even now my cousins and I all went to Jamaica and my aunts were like “oh my god, you guys got so dark.” I’m like yes that’s what happens when you have melanin and you go in the sun. I really don’t understand what the problem is. There’s so much pressure on girls in particular because you’re instilling this self-esteem issue. It’s everywhere too — when I was in India I saw lotion brushes that said “set your fairness.” Why is that being portrayed as what is meant to be attractive? It’s so non-inclusive. It’s hard enough as an Indian girl to walk around Times Square and see anyone that looks like you, but then to have them be so white, that doesn’t represent me anyway. Everything comes back down to politics and white supremacy is the bottom line of every issue we have. Shadeism is no exception to that — we need to teach brown girls and black girls, women of any color, that just because you have dark skin it doesn’t mean that you are any less worthy, you’re any less intelligent or any less able to be successful. How can we come out of racism when we do it to each other? I try to make a valiant effort and everything I do, I say that I do it for brown girls. Not only am I one of you but I also know we don’t have that many people rooting for us. Do you hope that the modeling industry changes in terms of diversity? I think it’s making really good strides. I did three or four campaigns for Aerie for their ‘All Women’ campaign and they really believe what they are saying. They work closely with the National Eating Disorder Association for example. They don’t just sell clothing, they invest money in these campaigns. They really believe the message and believe in body positivity. I think body positivity is here to stay. I think that diversity is always going to be a problem. I went to a casting the other day and I was the only non-white girl out of 20 other models. I am on the advisory board now for the Model Alliance. I want to work on a big research project with them about the images that we see. They did this research about body positivity discovering that 67 percent of women are over a size 12 but only two percent of images in media actually portray women as over a size 12. I think we need to do that for women of color. How many images are we seeing where we see ourselves represented? Once we get really information and real stats, that will help us to move forward. If you ever stop working as a model, what would you like to do? Many things! I would love to be like Cameron Russell, Geena Rocero, Sara Ziff, or Franchesca Ramsey. They are in media but they are doing something of substance. I would love to host a show, work on a book or have a podcast. I want to be a media personality but I don’t want it to be about fashion or beauty. Not to diminish what bloggers do, but I want to be fighting for black and brown girls every day.